A homemade pancake breakfast is a great way to kick off a new day — or year, as the occasion allows. Maple syrup avoiders will love that these almond flour-based pancakes are sweet enough that they are delicious enjoyed without any additional accouterment. And should you have any leftovers, well, those are terrific nibbled straight from the fridge. Hope you enjoy this buttermilk pancake alternative as much as I do! Preheat griddle over medium heat. In a small bowl, whisk together almond meal through baking soda; set aside. In a blender or food processor, combine eggs through evaporated cane juice; cover and blend on high for 1 minute. Add almond meal mixture to the blender, cover and blend on high until smooth (you may need to scrape down the bowl several times to get everything combined, it’s pretty thick). Lightly grease preheated griddle with butter or oil. 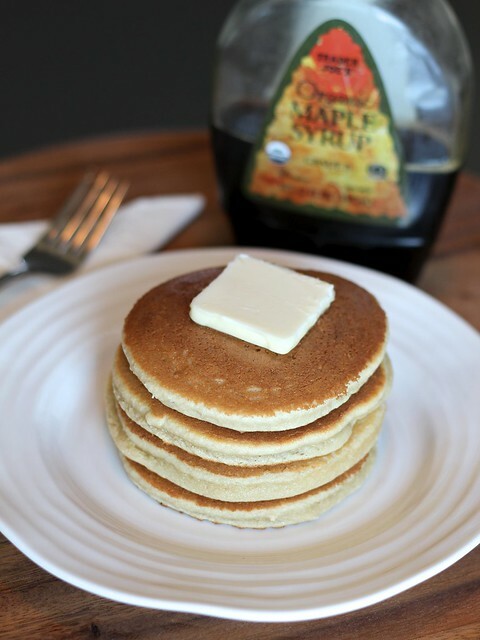 For each pancake, scoop about 1⁄4 cup of batter onto the griddle; immediately use a spatula to spread batter out until it’s an even thickness and about 4″ wide. Cook until golden brown on the first side (about 4 minutes), flip and cook until golden brown on the other (about 4 minutes more). Serve immediately!